I previously mentioned explorer Bill Stone and his recent robotic explorations of Mexican cave systems. Well, it looks like those old fashioned carbon based entities can still make important discoveries. Two cave divers, Stephen Bogaerts, and Robbie Schmittner have recently found the world's longest underground river system. Divers exploring a maze of underwater caves on Mexico's Yucatán Peninsula have identified what may be the longest underground river in the world. The waterway twists and turns for 95 miles (153 kilometers) through the region's limestone caverns, said British diver Stephen Bogaerts, who made the discovery with German colleague Robbie Schmittner. In a straight line, the system would span about six miles (ten kilometers) of land. 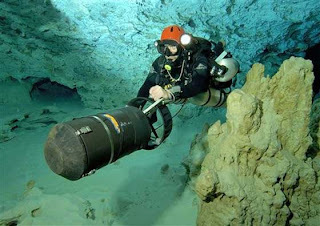 Bogaerts and Schmittner spent four years exploring using underwater scooters and specially rigged gas cylinders to find a connection between the Yucatán region's second and third longest cave systems, known respectively as Sac Actun and Nohoch Nah Chich (Mexico map). "We expected to have done it by December 2004," Bogaerts said. "But, unfortunately, we were unable to make the connection in the area we were looking in, so we had to look somewhere else." The team scoured the passages, marking each new twist and turn with carefully labeled rope. On January 23 the pair headed toward the final connection from opposite sides and used an unopened bottle of champagne to make the final tie-off between the two systems. "It's a little bit like planting a flag on the moon or the top of [Mt.] Everest," Bogaerts said. Read the whole thing. More here, and here. On a related note, the newspapers have been carrying reports of a huge underground “ocean” . Sorry. Some slightly moist rocks do not make an ocean. However, can organisms make use of such water? Could the biosphere extend down as far as Earth's mantle?